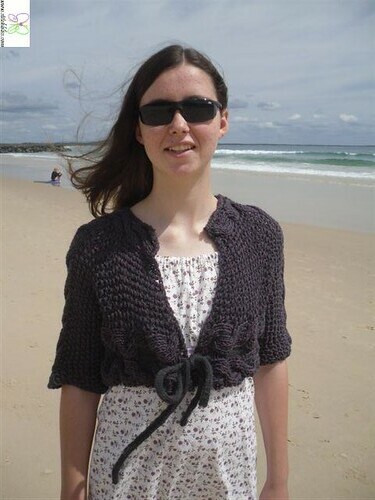 I made version 2 of this pattern, which is for a short, sideways knitted cardigan with three cables. The cardigan ties with an eye cord that runs through one of the cables. For the cardigan I used Alpaca Silk Georgette 751 Pebble and Soho Summer DK Cotton 234 Currant. I used Currant instead of Soho Summer DK Cotton 216 Sapote, which is the yarn used in the pattern instructions, because I preferred the colour combination of purple and steel grey to the suggested brown and steel grey, which seemed a bit dull to me. The needles I used were 5.5mm and 10.0mm single pointed needles, a cable needle, a stitch holder and 5.5mm double pointed needles. The two yarns together feel soft and make the pattern look slightly lacy, because they're knitted together on large needles. The two yarns worked really well for the cardigan, I love the combined colours and the yarns feel very soft. The cardigan is also a perfect weight for where I live, it gives some warmth but isn't too hot, because of its lacy texture. It took me about 2 months of on and off again knitting to complete the garment, however the actual time spent knitting was very quick and there was minimal sewing up. Probably the most time consuming part of the cardigan was knitting the i-cord. My only complaint about this pattern would be the minor errors in the last section, where purls and knit stitches were swapped incorrectly. On the whole I am very happy with the cardigan, it turned out almost exactly as expected and is quite light to wear. 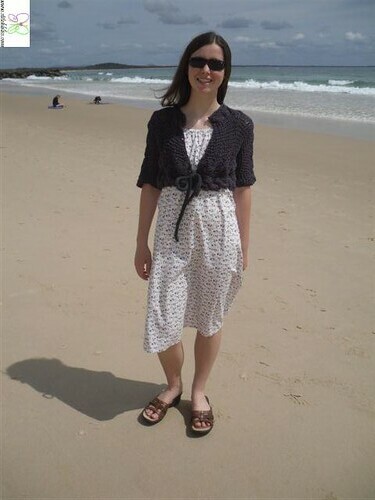 So far I've worn it with a dress during a breezy day at the beach and at work over a blouse, with a skirt. I am really satisfied with the cardigan, hopefully I'll be able to wear it a lot. I think it will dress up a jeans outfit, or look smart and casual over a more formal outfit.